H0022-4 - Gerald Ford as student Madison Elementary School, ca. 1923. (Full size image is 55K) Gerald Rudolph Ford, the 38th President of the United States, was born Leslie Lynch King, Jr., the son of Leslie Lynch King and Dorothy Ayer Gardner King, on July 14, 1913, in Omaha, Nebraska. His parents separated two weeks after his birth and divorced later that year. He and his mother eventually settled in Grand Rapids, Michigan where her parents lived. On February 1, 1916, Dorothy King married Gerald R. Ford, a Grand Rapids paint salesman. The Fords began calling her son Gerald R. Ford, Jr., although his name was not legally changed until December 3, 1935. He had known since he was thirteen years old that Gerald Ford, Sr., was not his biological father, but it was not until 1930 when Leslie King made an unexpected stop in Grand Rapids that he had a chance meeting with this biological father. The future president grew up in a close-knit family which included three younger half-brothers, Thomas, Richard, and James. Ford attended South High School in Grand Rapids, where he excelled scholastically and athletically, being named to the honor society and the "All-City" and "All-State" football teams. He was also active in scouting, achieving the rank of Eagle Scout in November 1927. He earned spending money by working in the family paint business and at a local restaurant. From 1931 to 1935 Ford attended the University of Michigan at Ann Arbor, where he majored in economics. He graduated with a B.A. degree in June 1935. He financed his education with part-time jobs, a small scholarship from his high school, and modest family assistance. A gifted athlete, Ford played on the University's national championship football teams in 1932 and 1933. He was voted the Wolverine's most valuable player in 1934 and on January 1, 1935, played in the annual East-West College All-Star game in San Francisco, for the benefit of the Shrine Crippled Children's Hospital. In August 1935 he played in the Chicago Tribune College All-Star football game at Soldier Field against the Chicago Bears. H0035-1 - Gerald Ford at the University of Michigan, with fellow football players Russell Fuog, Chuck Bernard, Herman Everhardus, and Stan Fay, 1934. He received offers from two professional football teams, the Detroit Lions and the Green Bay Packers, but chose instead to take a position as boxing coach and assistant varsity football coach at Yale hoping to attend law school there. Among those he coached were future U.S. Senators Robert Taft, Jr. and William Proxmire. Yale officials initially denied him admission to the law school, because of his full-time coaching responsibilities, but admitted him in the spring of 1938. Ford earned his LL.B. degree in 1941, graduating in the top 25 percent of his class in spite of the time he had to devote to his coaching duties. His introduction to politics came in the summer of 1940 when he worked in Wendell Willkie's presidential campaign. After returning to Michigan and passing his bar exam, Ford and a University of Michigan fraternity brother, Philip A. Buchen (who later served on Ford's White House staff as Counsel to the President), set up a law partnership in Grand Rapids. He also taught a course in business law at the University of Grand Rapids and served as line coach for the school's football team. He had just become active in a group of reform-minded Republicans in Grand Rapids, calling themselves the Home Front, who were interested in challenging the hold of local political boss Frank McKay, when the United States entered World War II. In April 1942 Ford joined the U.S. Naval Reserve receiving a commission as an ensign. After an orientation program at Annapolis, he became a physical fitness instructor at a pre- flight school in Chapel Hill, North Carolina. In the spring of 1943 he began service in the light aircraft carrier USS MONTEREY. He was first assigned as athletic director and gunnery division officer, then as assistant navigator, with the MONTEREY which took part in most of the major operations in the South Pacific, including Truk, Saipan, and the Philippines. His closest call with death came not as a result of enemy fire, however, but during a vicious typhoon in the Philippine Sea in December 1944. He came within inches of being swept overboard while the storm raged. The ship, which was severely damaged by the storm and the resulting fire, had to be taken out of service. Ford spent the remainder of the war ashore and was discharged as a lieutenant commander in February 1946. When he returned to Grand Rapids Ford became a partner in the locally prestigious law firm of Butterfield, Keeney, and Amberg. A self-proclaimed compulsive "joiner," Ford was well-known throughout the community. Ford has stated that his experiences in World War II caused him to reject his previous isolationist leanings and adopt an internationalist outlook. With the encouragement of his stepfather, who was county Republican chairman, the Home Front, and Senator Arthur Vandenberg, Ford decided to challenge the isolationist incumbent Bartel Jonkman for the Republican nomination for the U.S. House of Representatives in the 1948 election. He won the nomination by a wide margin and was elected to Congress on November 2, receiving 61 percent of the vote in the general election. During the height of the campaign Gerald Ford married Elizabeth Anne Bloomer Warren, a department store fashion consultant. They were to have four children: Michael Gerald, born March 14, 1950; John Gardner, born March 16, 1952; Steven Meigs, born May 19, 1956; and Susan Elizabeth, born July 6, 1957. Gerald Ford served in the House of Representatives from January 3, 1949 to December 6, 1973, being reelected twelve times, each time with more than 60% of the vote. He became a member of the House Appropriations Committee in 1951, and rose to prominence on the Defense Appropriations Subcommittee, becoming its ranking minority member in 1961. He once described himself as "a moderate in domestic affairs, an internationalist in foreign affairs, and a conservative in fiscal policy." As his reputation as a legislator grew, Ford declined offers to run for both the Senate and the Michigan governorship in the early 1950s. His ambition was to become Speaker of the House. In 1960 he was mentioned as a possible running mate for Richard Nixon in the presidential election. In 1961, in a revolt of the "Young Turks," a group of younger, more progressive House Republicans who felt that the older leadership was stagnating, Ford defeated sixty-seven year old Charles Hoeven of Iowa for Chairman of the House Republican Conference, the number three leadership position in the party. In 1963 President Johnson appointed Ford to the Warren Commission investigating the assassination of President John F. Kennedy. In 1965 Ford co-authored, with John R. Stiles, a book about the findings of the Commission, Portrait of the Assassin. The battle for the 1964 Republican nomination for president was drawn on ideological lines, but Ford avoided having to choose between Nelson Rockefeller and Barry Goldwater by standing behind Michigan favorite son George Romney. In 1965 Ford was chosen by the Young Turks as their best hope to challenge Charles Halleck for the position of minority leader of the House. He won by a small margin and took over the position early in 1965, holding it for eight years. Ford led Republican opposition to many of President Johnson's programs, favoring more conservative alternatives to his social welfare legislation and opposing Johnson's policy of gradual escalation in Vietnam. As minority leader Ford made more than 200 speeches a year all across the country, a circumstance which made him nationally known. 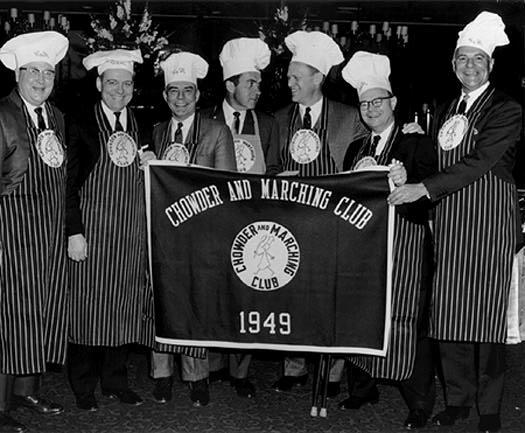 AV82-31-502 - Richard Nixon, Gerald Ford and other members of the Chowder and Marching club at a meeting celebrating Mr. Ford's becoming Minority Leader, February 24, 1965. In both the 1968 and 1972 elections Ford was a loyal supporter of Richard Nixon, who had been a friend for many years. In 1968 Ford was again considered as a vice presidential candidate. Ford backed the President's economic and foreign policies and remained on good terms with both the conservative and liberal wings of the Republican party. Because the Republicans did not attain a majority in the House, Ford was unable to reach his ultimate political goal--to be Speaker of the House. Ironically, he did become president of the Senate. When Spiro Agnew resigned the office of Vice President of the United States late in 1973, after pleading no contest to a charge of income tax evasion, President Nixon was empowered by the 25th Amendment to appoint a new vice president. Presumably, he needed someone who could work with Congress, survive close scrutiny of his political career and private life, and be confirmed quickly. He chose Gerald R. Ford. Following the most thorough background investigation in the history of the FBI, Ford was confirmed and sworn in on December 6, 1973. 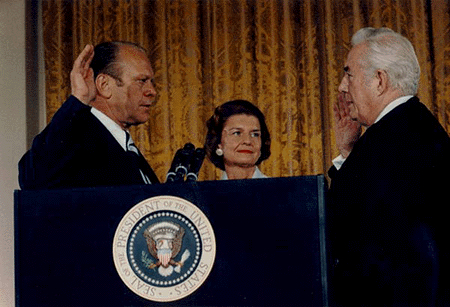 A0004-10 - Gerald R. Ford is sworn in as the 38th President of the United States by Chief Justice Warren Burger as Mrs. Ford looks on, August 9, 1974. The specter of the Watergate scandal, the break-in at Democratic headquarters during the 1972 campaign and the ensuing cover-up by Nixon administration officials, hung over Ford's nine-month tenure as vice president. When it became apparent that evidence, public opinion, and the mood in Congress were all pointing toward impeachment, Nixon became the first president in U.S. history to resign from that office. Gerald R. Ford took the oath of office as President of the United States on August 9, 1974, stating that "the long national nightmare is over. Our Constitution works." Within the month Ford nominated Nelson Rockefeller for vice president. On December 19, 1974, Rockefeller was confirmed by Congress, over the opposition of many conservatives, and the country had a full complement of leaders again. One of the most difficult decisions of Ford's presidency was made just a month after he took office. Believing that protracted impeachment proceedings would keep the country mired in Watergate and unable to address the other problems facing it, Ford decided to grant a pardon to Richard Nixon prior to the filing of any formal criminal charges. Public reaction was mostly negative; Ford was even suspected of having made a "deal" with the former president to pardon him if he would resign. The decision may have cost him the election in 1976, but President Ford always maintained that it was the right thing to do for the good of the country. President Ford inherited an administration plagued by a divisive war in Southeast Asia, rising inflation, and fears of energy shortages. He faced many difficult decisions including replacing Nixon's staff with his own, restoring the credibility of the presidency, and dealing with a Congress increasingly assertive of its rights and powers. In domestic policy, President Ford felt that through modest tax and spending cuts, deregulating industries, and decontrolling energy prices to stimulate production, he could contain both inflation and unemployment. This would also reduce the size and role of the federal government and help overcome the energy shortage. His philosophy was best summarized by one of his favorite speech lines, "A government big enough to give us everything we want is a government big enough to take from us everything we have." The heavily Democratic Congress often disagreed with Ford, leading to numerous confrontations and his frequent use of the veto to control government spending. Through compromise, bills involving energy decontrol, tax cuts, deregulation of the railroad and securities industries, and antitrust law reform were approved. In foreign policy, Ford and Secretary of State Kissinger continued the policy of detente with the Soviet Union and "shuttle diplomacy" in the Middle East. U.S.-Soviet relations were marked by on-going arms negotiations, the Helsinki agreements on human rights principles and East European national boundaries, trade negotiations, and the symbolic Apollo-Soyuz joint manned space flight. Ford's personal diplomacy was highlighted by trips to Japan and China, a 10-day European tour, and co-sponsorship of the first international economic summit meeting, as well as the reception of numerous foreign heads of state, many of whom came in observance of the U.S. Bicentennial in 1976. 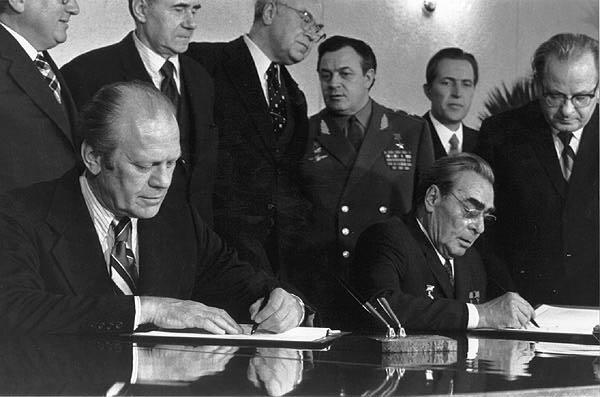 A2092-3A - President Ford and Soviet General Secretary Leonid I. Brezhnev sign a Joint Communique following talks on the limitation of strategic offensive arms in the conference hall of the Okeansky Sanitarium, Vladivostok, USSR, November 24, 1974. With the fall of South Vietnam in 1975 as background, Congress and the President struggled repeatedly over presidential war powers, oversight of the CIA and covert operations, military aid appropriations, and the stationing of military personnel. On May 14, 1975, in a dramatic move, Ford ordered U.S. forces to retake the S.S. MAYAGUEZ, an American merchant ship seized by Cambodian gunboats two days earlier in international waters. The vessel was recovered and all 39 crewmen saved. In the preparation and execution of the rescue, however, 41 Americans lost their lives. On two separate trips to California in September 1975, Ford was the target of assassination attempts. Both of the assailants were women -- Lynette "Squeaky" Fromme and Sara Jane Moore. During the 1976 campaign, Ford fought off a strong challenge by Ronald Reagan to gain the Republican nomination. He chose Senator Robert Dole of Kansas as his running mate and succeeded in narrowing Democrat Jimmy Carter's large lead in the polls, but finally lost one of the closest elections in history. Three televised candidate debates were focal points of the campaign. Upon returning to private life, President and Mrs. Ford moved to California where they built a new house in Rancho Mirage. President Ford's memoir, A Time to Heal: The Autobiography of Gerald R. Ford, was published in 1979. After leaving office, President Ford continued to actively participate in the political process and to speak out on important political issues. He lectured at hundreds of colleges and universities, on such issues as Congressional/White House relations, federal budget policies, and domestic and foreign policy issues. He attended the annual Public Policy Week Conferences of the American Enterprise Institute, and in 1982 established the AEI World Forum, which he hosted for many years in Vail/Beaver Creek, Colorado. This was an international gathering of former and current world leaders and business executives to discuss political and business policies impacting current issues. In 1981, the Gerald R. Ford Library in Ann Arbor, Michigan, and the Gerald R. Ford Museum in Grand Rapids, Michigan, were dedicated. President Ford participated in conferences at either site dealing with such subjects as the Congress, the presidency and foreign policy; Soviet-American relations; German reunification, the Atlantic Alliance, and the future of American foreign policy; national security requirements for the ‘90s; humor and the presidency; and the role of First Ladies. The former President was the recipient of numerous awards and honors by many civic organizations. He was also the recipient of many honorary Doctor of Law degrees from various public and private colleges and universities. President Ford died on December 26, 2006 at his home in Rancho Mirage, California. After ceremonies in California, Washington, and Grand Rapids, he was interred on the grounds of the Gerald R. Ford Presidential Museum in Grand Rapids.